If you visit Berlin for more than just a weekend, you might want to add some variety to your program of touristic attractions and historic sights. 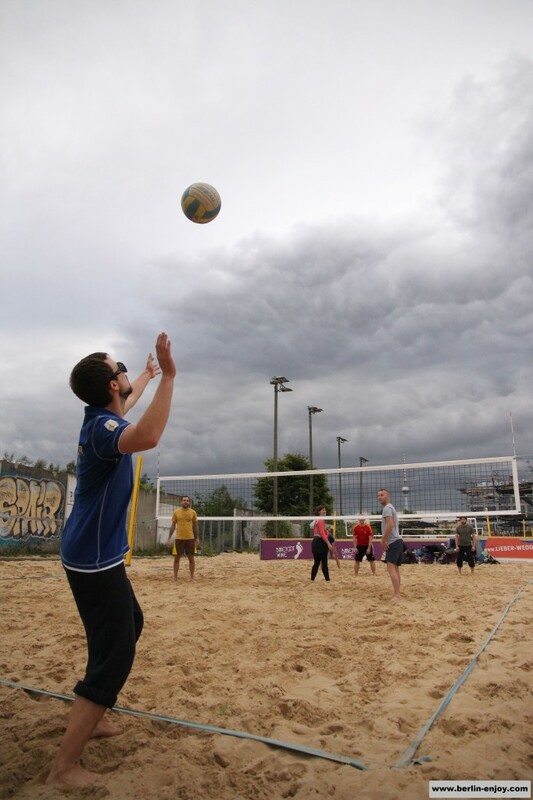 Why not consider burning some calories while playing beachvolleyball in Berlin? There are many different courts all over the city and this article should help you decide which one fits to you. Beachvolleyball is one of these sports which you can play with a very versatile group of people. Obviously some people are more talented than others but you can always make sure the teams are evened out. Therefore beachvolleyball is a great activity for friends, family and colleagues. Another great benefit of playing beachvolleyball in Berlin is the price: One court for one hour in the evening or weekend costs only 14-20 Euro. Besides the price there are several other things you should keep in mind when you are deciding where you are going to play beachvolleyball in Berlin. Obviously the location is crucial because you do not want to travel to the other side of the city. Besides that it might be nice to have a shower and many of you will also prefer a cold beer on a nice terrace after the match. All in all it makes sense to compare the beachvolleyball-courts in Berlin before making a reservation. We hope our list with the best courts can help you with that. BeachBerlin is the largest location to play beachvolleyball in Berlin, it has 50 courts and one hour of playing costs 16 Euro (per court). BeachBerlin is located close to station Nordbahnhof so it is not the most central location but still very easy to reach (only two stops south from station Friedrichstraße). You can play beachvolleyball every day from 10.00 and you have to stop playing at 22.00. Although the last game will end at 22.00, this does not mean that you will have to go home. BeachBerlin might not be the cheapest place to play beachvolleyball in Berlin, it sure does have one of the nicest bar-area. You can offer many nice and refreshing drinks and also food is available. Besides that there are changing-rooms and showers. Beach61 is one of my favourite places to play beachvolleyball and located in Kreuzberg. This location offers 25 courts and as you can see on the image below, there is also enough room to chill before and after the game. Beach61 is located in a park called Gleisdreieck and therefore also most easily reached from station Gleisdreieck. Although this is a very central location, it is easiest to reach by bike. If you want to play a round of beachvolleyball in the evening or weekend, you will have to pay 20 Euro per court per hour. This means that Beach61 is a bit more expensive than some of the other options in this list. 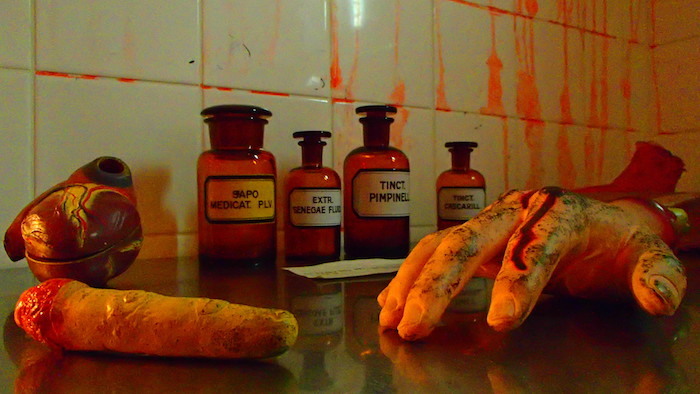 But in return they offer tournaments, courses, showers and a very good assortiment of drinks. The beachvolleyball-courts of Beach61 are opened till 22.00. 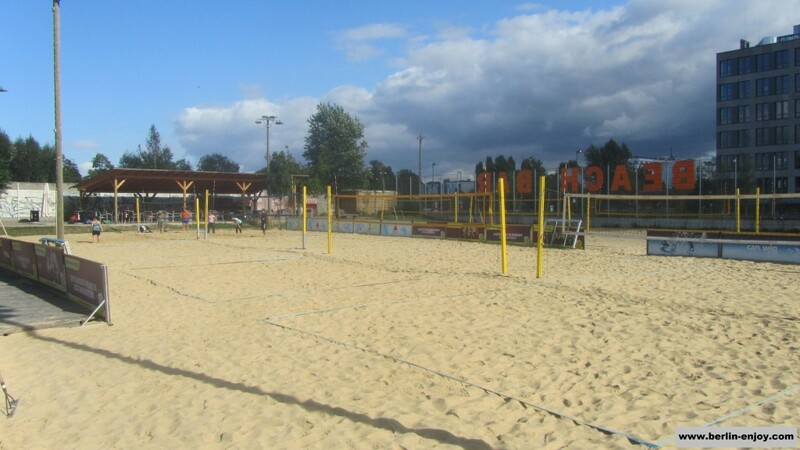 One of the most central located places to play beachvolleyball is City Beach. These courts are located directly next to Volkspark Friedrichshain. This location can be perfectly combined with a day in the park and is one of the cheapest locations compared to the other locations in Berlin. For one hour beachvolleybal at City Beach you only pay 14 Euro and in total there are 9 courts available. As you can calculate, the courts at City Beach are more than 5 Euro cheaper than the ones at BeachBerlin or Beach61. Although this is quite a difference, the additional services City Beach offers are also minimal. There are no real showers and there is just a small stand where you can order a beer. There is plenty of room to sit at wooden tables. If you would like to play beachvolleyball in Berlin in the winter you could consider visiting East61. 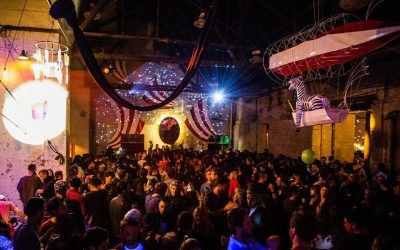 This venue is run by the same organisation as Beach61 in Kreuzberg and is located in Schöneberg. It is easiest to reach these courts from station Südkreuz or Julius-Leber-Brücke. A great thing about East61 is that you can also play beachvolleyball in the winter and summer. There are 10 inside-courts and 9 outside-courts here. 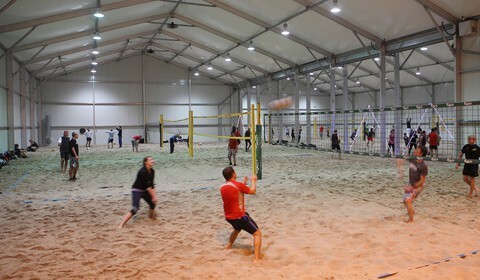 Playing beachvolleyball in the evening-hours or weekend costs 20 Euro per hour at East61. After a match you can get a cold beer at the bar. Although playing inside is a different feeling, East61 made sure there is enough light in the hall and the doors are normally open to let some fresh air in. If you want to play beachvolleyball in the winter, this is one of the best locations in Berlin. One of the most luxury places to play beachvolleyball in Berlin is South Beach. The prices are higher at this location but you can enjoy the sauna and the sand is even heated for comfortable playing. During weekdays from 10.00 till 16.00 you can play for 24 Euro an hour but at the more populair moments this price jumps up to 36 Euro an hour. More than double of what you pay at the other places in this list, but if you like comfort you might still want to consider South Beach. This location also offers other sports like climbing, beachsoccer, beachminton and more. South Beach offers 7 indoor-courts and recently opened 4 new outdoor-courts as well. As the name already indicates, South Beach is located more in the south of Berlin. 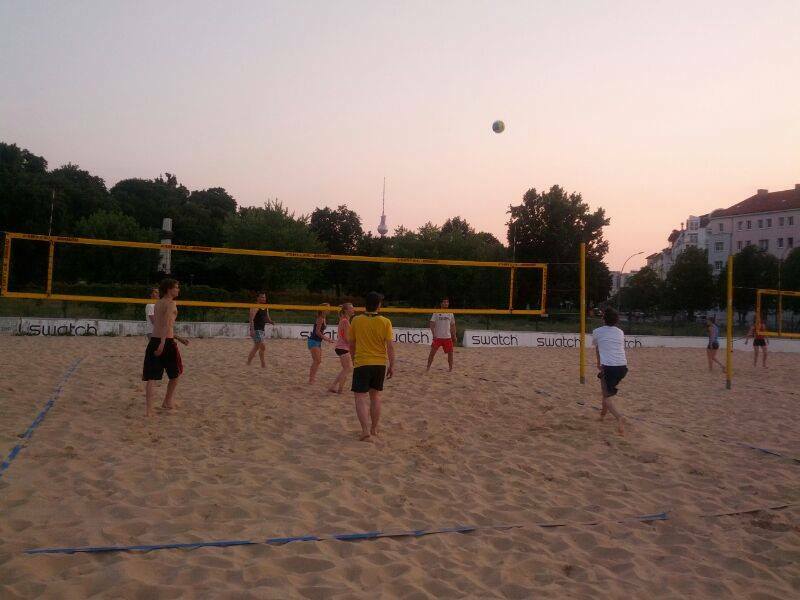 In the area not far from airport Tempelhof you can find South Beach at the address Trachenbergring 85 and play volleyball till 22.00 in the weekends and till midnight on weekdays. As you can read there are plenty of opportunities if you want to play beachvolleyball in Berlin. Depending on your location it might be best to choose a location which is easy to reach but you can also decide to look at other aspects: Maybe visit the cheapest location (City Beach), the largest (BeachBerlin) or an indoor location (South Beach or East61). Obviously there are many other beachvolleyball-courts in Berlin and suggestions are always welcome. Hi, Is it possible to work as a volleyball coach in these places? Unfortunately I cannot answer that question for you. I listed the beachvolleyball-locations but have no direct contact with them. I would just contact them directly if I were you. I was wondering how does it work ? Is it better to can with friends or we can just come and join people who plays ? Thanks for your reply and the compliments. It is best if you make a reservation and come with some friends. Sometimes you find someone who wants to join but most of the time the other people are playing Beachvolleyball for themselves. Thumbs up Job. This is very helpful for new comers, like my self. I know beach volley ball is a very beautiful way to relax. One question, do these spots have balls on site, or one has to carry their own. There are balls on site, you have to pay 1 Euro per hour to “rent” them.